Nebraska’s waterbodies are in danger. Never release bait into a waterbody. Always dispose of unused bait on land or in the trash. Invasive species including Asian carp and rusty crayfish can be found in fish bait and should never be used. 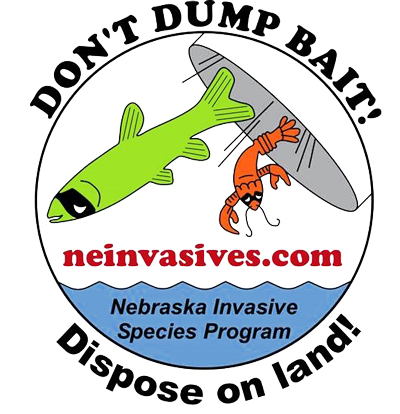 Learn to identify invasive bait by looking at species information on this website. Many people don’t realize the potential impact releasing bait can have on our native and game fish populations. Buy bait from reputable bait dealers and follow State regulations regarding bait. Don’t move bait from one waterway to another. Dispose of unused bait, dead fish, and fish parts in a secure trash area away from the water. And remember: freezing bait doesn’t kill viruses or disease. Empty all water from boats, buckets, bilges, live wells, and other equipment. Remove all mud, plants, and aquatic life from equipment before moving it to another body of water. Thoroughly clean and dry all fishing and boating equipment including bait buckets, boots, boats, and trailers before moving them to another body of water. Don’t release fish, plants, or animals into a body of water unless they came out of that waterbody. Video - Don't Dump Bait!